Our leadership academy equips, engages, and exposes our students to what fits their interests. We equip our students with tangible tools for their leadership journey. Our approach helps put students’ ideas into practice to positively impact their local communities. Our students are exposed to new and unique ideas and insights. Positive stories of impact are all around us. We bring these stories to light throughout their time at the program that highlights inspirational and informational ways to make a difference. We engage students where they are with what interests them. Through a combination of inspiring storytelling and technology, we create compelling ways for students to re-imagine leadership and what is possible. Our students’ pair with a mentor to show them the ins-and-outs of what needs to be done in order to reach their short term goals and directing them on the steps they need to take to reach the long term goals. We break our students out of their comfort zone so that they can be more open to engaging in new things. Students gain each other’s trust by working as a team and are open with each other by communicating with others in a judgment free zone. They learn how to be responsible by taking responsibility for their actions and being honest weather they’re right or wrong. We actively engage in outreach services; by providing services and information we let the community know what it is that we have to offer to our youth. We engage in our community by attending events, passing out brochures, word of mouth, Sometimes, instructors simply ask members for donations at the beginning of an event. We try to have as many events as possible annually so that we can build a bigger platform on what it is that we do for our youth here in Louisville, Kentucky. The community outreach is another way to self-promote our incorporation but it also gives our students opportunity to engage in something they may not have done before or did well in past scenarios similar to outreach. These students are able to work in outreach events to prepare them for real-world interactions with people you aren’t familiar with. At the academy tutoring is provided to everyone regardless of grades. We are open to accept new tutors if you’re willing to become a partner with Theta Omega Inc. Men of (Q)uality. Potential tutors are required to fill out an application and have the required skills needed to be accepted as a tutor. Our tutors must be able to work as a team while supporting one another and also be willing to give reports on the student’s performance to their legal parent/guardian. Our tutors are focused on the academic development of our students. Other than student reports our tutors communicates with the students’ parents/guardian about their developments and what they need to improve in. The tutors support the students so they can build the self-confidence that they need to complete their homework and projects to the best of their ability. I WILL REPRESENT THE MAN OF QUALITY THAT I AM. 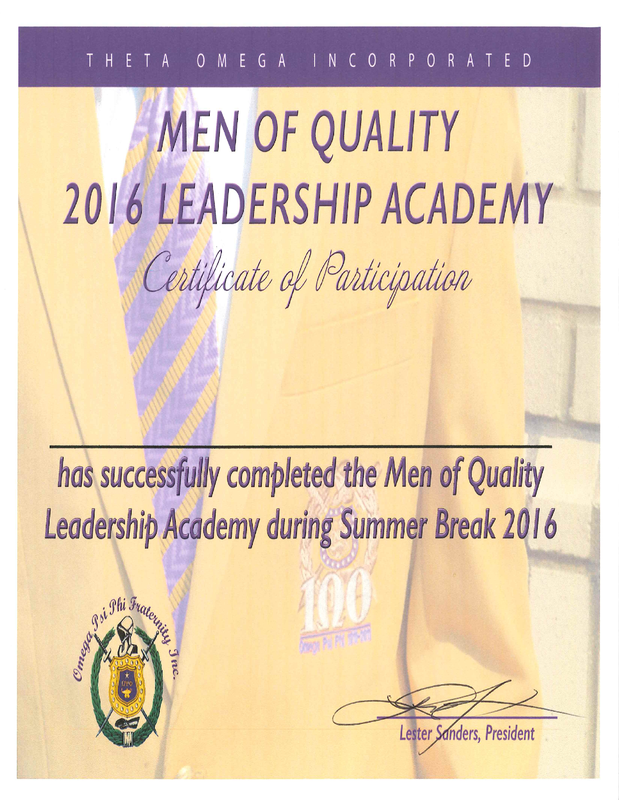 EACH DAY I WILL WALK AND TALK LIKE THE MAN OF QUALITY THAT I AM!